﻿ Carb Nutritional Metabolic Type | Wake the Fork Up®! Coconut Oatmeal Bar- makes 9 bars. Instructions: In a large bowl, combine all dry ingredients. In a separate bowl, combine wet ingredients. Pour wet ingredients into dry and completely combine. In a separate microwave-safe bowl, place chopped dates and cover with water. Microwave for 3-4 minutes, or until water is boiling. Allow dates to sit in hot water for 5 minutes. Drain off water. Use the back of a fork to mash the dates. Melt dark chocolate chips and stir into the mashed dates. Stir in peanut butter. Line a 8×8-inch dish with wax paper. Press half of the granola bar dough into bottom of the dish. Spread the chocolate date caramel evenly over the granola bar layer. Top with another layer of the granola bar dough. Cover and refrigerate for at least 2 hours. Cut into 9 bars and wrap in plastic wrap. Store in the fridge for a week or in the freezer for longer. * Serve 2 granola bars with 14 oz. of organic plain 2% Greek Yogurt and 2 cups of organic raspberries. 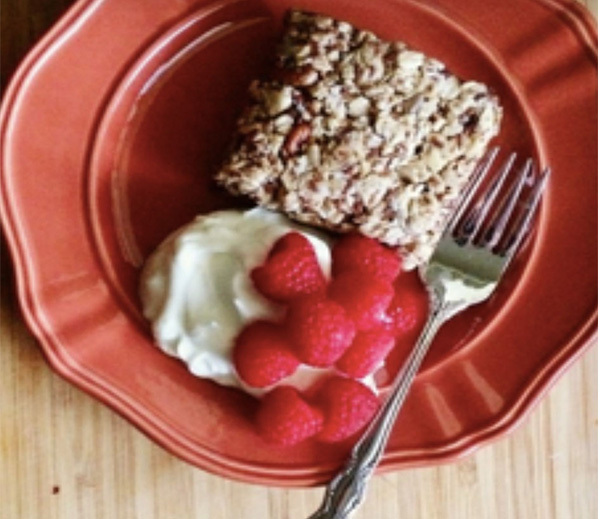 • Granola Bar recipe & image courtesy of Kylie Mitchell. • Why this meal is slimming savvy: Medium chain fatty acids (found in coconut oil) provide the body with a “quick” source of energy without an insulin surge. While insulin surges bring blood sugar within cells and block fat from being burned, no surge allows the body to be the fat burning machine it was designed to be. Furthermore, consistent CLA intake found in organic dairy is linked to long term weight management by lowering body fat.